However, early in 1962 I was still there, and a teenage passion for science fiction had suddenly made life more interesting. One of the writers I most admired was Brian Aldiss, who had written several intriguingly unusual short stories, and two or three novels which I thought were pretty good. One of them, Non-Stop, a brilliantly mad and inventive subversion of a trad American science fiction theme (a big spaceship lost in space), had so enthralled me that it had convinced me I should one day like to become a writer too. It took a while to get there, but I never forgot the epiphany of realizing that writing was a human activity that was achievable. Brian Aldiss had also published an anthology called Penguin Science Fiction. (Published by Penguin Books, and full of science fiction, of course.) In the short biography of the editor it mentioned that Mr Aldiss was the president of something called the British Science Fiction Association — I imagined it to be a place where people with mighty minds and vivid imaginations would meet in conclave. One evening I read a review in the London Evening News of a new novel by John Christopher called The World in Winter. The review gave extravagant praise to this book, but ruined everything by going on to complain that the novel had been marketed as science fiction, which the idiot reviewer described (but not in so many words) as a despicable commercial genre that of course no one could take seriously. This is a customary put-down of science fiction (still in use, no sign yet of its fall from usefulness) deployed by inexperienced reviewers who are trying to impress readers they assume to be even more stupid than themselves. Although I was only 18 I had already spotted this type. I felt weary contempt for whoever it was. Didn’t know what to say. Not Brian Aldiss, who had also seen this annoying review, and as president of the BSFA wrote a witty letter of complaint to the newspaper, pointing out what a dullard their reviewer was. They published his address at the end of his letter. I therefore wrote to Mr Aldiss, complimented him on his letter, and timidly asked if it was possible for nonentities like me to join the BSFA, or was it only for writers? Brian Aldiss responded at once, complimented me on having the right attitude, said that of course the BSFA was open to anyone (and passed on the contact address) and went on to urge me to attend the annual science fiction convention, where he would love to meet me and have a good conversation. It was a marvellous letter for an insecure and bookish teenager to receive. I treasured it and kept it, and to this day it remains the first item in my huge archive of correspondence. In fact, I was too hard up and too shy to go the SF convention, and did not meet Brian Aldiss in person until about 1965. Then, when he found out my name, he said, ‘I remember you — you wrote me that intelligent letter! Come and have a drink!’ It was the first moment of a friendship that was to last, with the usual ups and downs of any friendship between two difficult men, for more than half a century. 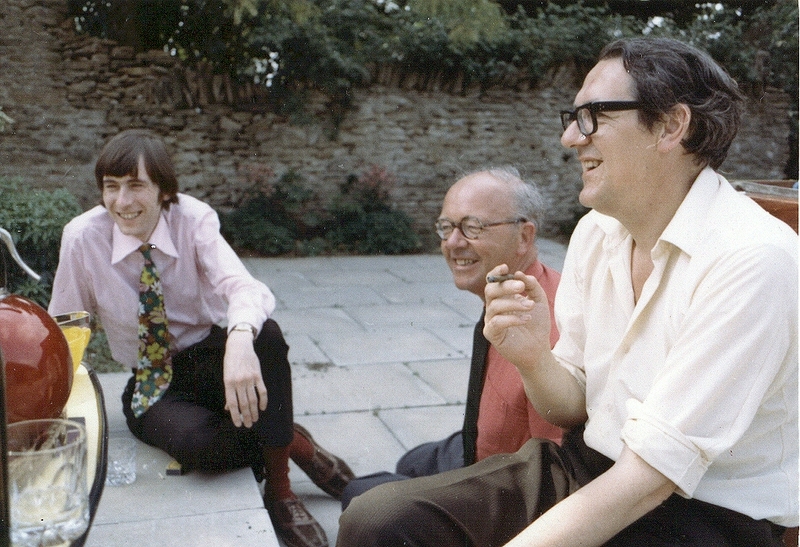 This is a photograph taken in June 1970, by Margaret, Brian Aldiss’s second wife. Brian had generously invited me down to their house in Oxfordshire to celebrate the publication of my first novel Indoctrinaire. Also there was Charles Monteith, who was not only my editor at the publishers Faber & Faber, he was Brian’s too. He had been responsible for buying and publishing all the early Aldiss books, including those short stories I had admired so much, and the fabulous bravura of Non-Stop. Today I learned that Brian had died, one day after his 92nd birthday. When someone has had such a long life, living to a great age, the end will not come as a surprise to those around, but none the less this news came as a profound and upsetting shock. I was privileged to write a long obituary for the Guardian, but a formal article is not the appropriate place to express fondness and gratitude for everything. His work shines out as an example to us all, a standard to strive to equal. His professionalism was legendary. His conversation was something to stay up all night for, and his sense of fun was marvellous. He is irreplaceable.